No. 1 UNC, No. 5 Indiana, No. 6 Notre Dame nad No. 7 Wisconsin will battle in the East region in Philadelphia beginning on Thursday. Who survives to Houston's Final Four? Despite what the final scores would indicate, North Carolina looked less than dominant in reaching its NCAA-record 27th Sweet 16. In the first round the Tar Heels led No. 16 Florida Gulf Coast by just one at halftime of an eventual 83–67 win. Two days later Carolina beat No. 9 Providence 85–66, but it failed to pull away until midway through the second half. Still, coach Roy Williams praised his squad’s mettle after it disposed of the Friars. “I'm getting more and more confident with my team every day,” Williams said. Indeed, there’s plenty of reason to buy stock in North Carolina. 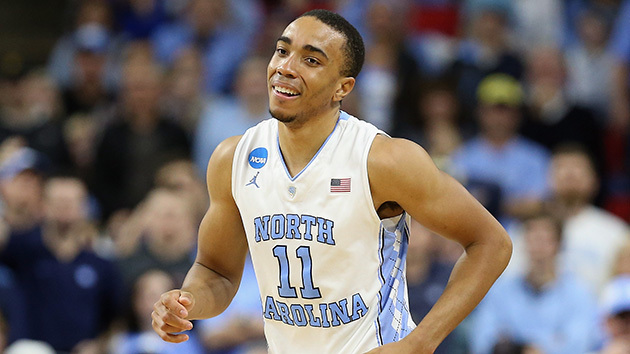 Its front line, led by forwards Isaiah Hicks, Brice Johnson and Kennedy Meeks, remains one of the best in basketball. Johnson is a game-changer on his own; in his first two tournament games, the 6’10” senior tallied 39 points and 17 rebounds. The frontcourt has taken pressure off a well-rounded backcourt featuring guards Marcus Paige and Joel Berry Jr. But keep an eye on the Tar Heels’ inability to put together a 40-minute game, which could spell trouble in the chalky East region in Philadelphia. Don’t be fooled by the Badgers’ seed; this squad appears built to match up with the Tar Heels. Wisconsin has yet to lose a rebounding battle in the NCAA tournament—it grabbed 12 offensive boards against Pitt—and it displayed a clutch gene against the Musketeers, where it won on Bronson Koenig’s buzzer-beating three. Forward Nigel Hayes, an All-Big Ten first-team honoree, has the ability to match North Carolina’s tenacity in the post. And it’s worth noting that Wisconsin has been to two straight Final Fours. Yogi Ferrell routinely steals the show for the Hoosiers, but Bryant might have been the biggest reason this program got past Kentucky in the second round. Bryant, a skilled 6’10’’ freshman center, scored 15 of his team-high 19 points in the final eight minutes of Indiana’s 73–67 win over the No. 4 Wildcats. Watching Bryant match up against the likes of Carolina’s Johnson in the Sweet 16 could be a sight to behold. The Irish have yet to face a single-digit seed in the NCAA tournament, having reached the Sweet 16 with wins over No. 11 Michigan—a First Four participant—and No. 14 Stephen F. Austin. Despite shooting 56.9% from the field, Notre Dame needed a last-second tip-in from reserve guard Rex Pflueger to survive the Lumberjacks on Sunday. Plus, given the Irish’s Jekyll-and-Hyde performances against top-seeded North Carolina this season, it’s impossible to predict which Notre Dame team shows up in Philadelphia. Thus far, we haven’t learned enough about coach Mike Brey’s crew in March. The Tar Heels simply have too much depth in their frontcourt, which has helped them slog through two tight wins in the Big Dance. Roy Williams heads to Houston with his head held high.